With assistance from Colorado State Parks, Clear Creek County Open Space is working on the development of trails at the eastern end of the county, concentrated at the Elmgreen Homestead.The goal is to achieve 3 - 4 miles of inter-connective trail loops, with connections down to the future Clear Creek Greenway in Clear Creek Canyon.Trail development in this area will achieve several objectives identified in the Clear Creek County Open Space Plan - including providing connections to other open spaces, parks, trails, and public property. 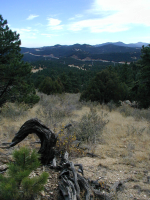 The Elmgreen Homestead Trail Plan is also a significant project because of its relationship to trail development, recreation management, and other state and local plans.The Denver Regional Council of Governments (DRCOG) open space plan, Metrovision 2020, lists Clear Creek Canyon, where the Homestead is located, as one of the most important geographic features to protect in the Denver Metro Region. The Elmgreen Homestead, with its scenic views from Clear Creek Canyon's southern rim and its surrounding area are full of history.In the late 1800's, Gus and Nellie Elmgreen homesteaded their ranch at the boundaries of Clear Creek and Jefferson Counties.The original 440-acre Elmgreen Ranch stretched along the meadow at Floyd Hill to the base of Saddleback Mountain.In the early 1920's, their son Arthur and his wife Hilda homesteaded another 440 acres on the upper bench of Clear Creek Canyon, extending nearly down to Clear Creek to run cattle. 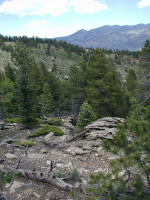 Thanks to the foresight and dedication of the Elmgreen family, they worked Elmgreen property scenic view with a collaborative effort, including Clear Creek County Open Space, Mountain Area Land Trust, Jefferson County, and Colorado State Parks, to preserve their property for all to enjoy.In d oing so, Clear Creek County Open Space obtained a substantial grant from Great Outdoors Colorado (GOCO) to purchase 110-acres of the Homestead.Another 110-acres was purchased by Jefferson County Open Space, and the remaining 220-acres were put into aconservation easement. 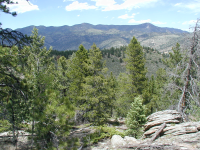 The Clear Creek County Open Space Commission intends to use the Elmgreen parcel and the surrounding County Lands to develop an integrated trail system between Interstate 70 and United States Highway 6.It is envisioned that two points of access will extend from both the eastern and western ends of of the trails loops down to the future Clear Creek Greenway.Using the planning grant from Colorado State Parks, Clear Creek County Open Space has hired professional trail planners to develop the Elmgreen Trail Plan.Planning is expected to conclude by the end of Summer 2004 in time for presentation for development to Volunteers for Outdoors Colorado (VOC).Development of the trails is expected to begin by the Summer of 2005.